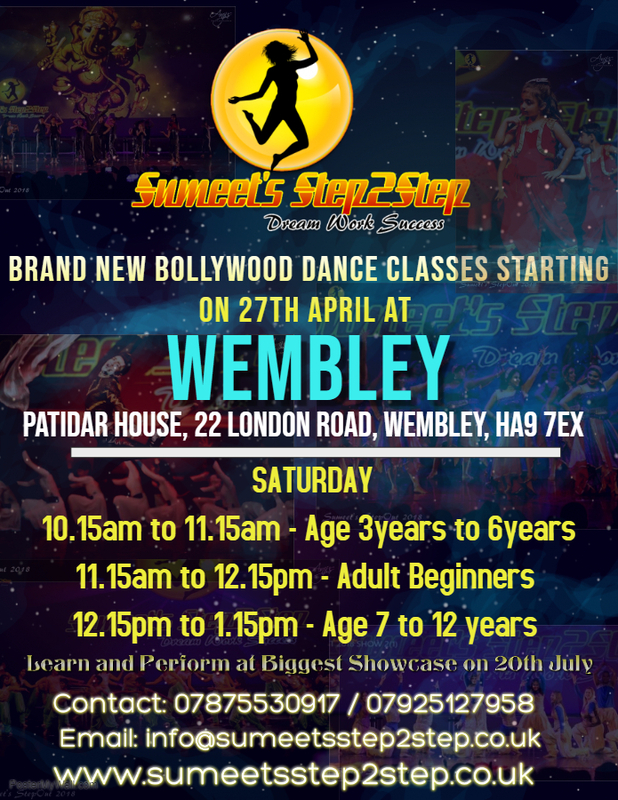 It gives us immense pleasure to announce SEVENTH Branch of Sumeet’s Step2Step Bollywood Dance Academy in WEMBLEY. We are successfully running at 6 different locations – HOUNSLOW, FELTHAM, ILFORD, LANGLEY, ORPINGTON, AMERSHAM & now launching WEMBLEY. Sumeet’s Step2Step currently have over 300 students learning Dance from our Dance Guru & Artistic Director Sumeet Sachdev. Sumeet has been dancing for over 15 years & is trained in modern forms of Dance like Hip Hop, Contemporary, Bollywood commercial etc. He has won various accolades throughout his journey as a Bollywood Dancer. Dancing alongside various Celebrities to Making them dance on his tunes & performing at prestigious venues like Royal Albert Hal, Wembley Arena, MOVEIT at O2, Sumeet is Ace with his exceptional Teaching skills. Full Term registration can be done on our website www.sumeetsstep2step.co.uk by completing online registration form. Please read the following information to help you get your dance season started off on the right foot! Please wear Comfortable clothing for the classes – No Jeans. Bottle of Water is a MUST. Each week we upload our class video on our YouTube channel “SumeetsStep2Step”. Dance tutorials are very helpful for home rehearsals, practising and tracking progress of students. Please feel free to contact us on below mentioned contact details if you need any assistance. I have attached Flyer for the Class please share with your near and dear ones who would to dance with us STEP2STEP!!! New Term Starts – APRIL 2019Why Is Dancing So Good for Your Brain?